Over Christmas I helped write a funding application to the AHRC Connected Communities and Design Highlight with Janet Batsleer, Nic Whitton and Tony Fry (Griffith University). The highlight was to explore design thinking in a context of bringing communities together. I’m a bit of a social innovation hobbyist, and as part of that I’m fascinated by design thinking and service design . I like any framework, methodology or set of practices that are supposedly generalizable tools for getting stuff done, and design is definitely a Swiss-army-knife kind of a social technology. The basic idea is that where design principles were applied to making chairs and other products, now design thinking is used, for example, to improve services working with vulnerable groups (e.g., Participle). Service designers are the social scientist’s cooler younger brother/ sister, with their funky glasses and better hair to our corduroys and disapproving looks. The idea for our project emerged out of a discussion with @JayneLawton when she explained that (ex-) homeless people maintain Sackville Gardens in Manchester city centre. An interesting question from this was how could we make visible and communicate the contribution of these people to the community, especially as someone walking past might just assume if, for example, the gardeners were taking a break that this was just a bunch of homeless guys ruining an urban oasis in a mixed retail and leisure zone. In discussing the tensions and potentials of this site we quickly came to realise how the philosophy of Jaques Ranciere was incredibly useful in providing an analysis of the exclusion of those present but not part of a community. Drawing on the concepts of the sans papiers, the distribution of the sensible, and dissensus we were able to conceptualise the sorts of conditions and processes through which the ‘sans receipts’ (those without the money to inhabit urban spaces) could be visible and heard, redefining the rules that govern who is part of a community. 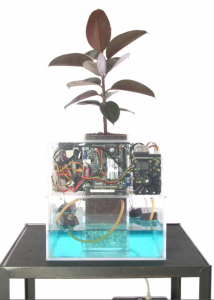 “Spore 1.1 is a self-sustaining ecosystem for a rubber tree plant purchased at Home Depot. In this project, Home Depot is responsible for the plant in two ways: first, an unconditional guarantee to replace any plant they sell, for up to one year; second through an implied cybernetic contract. This second responsibility is the creative content for the work, where the economic health of Home Depot is transitioned through a series of physical computing techniques to a mechanism for controlling the watering of the rubber tree. 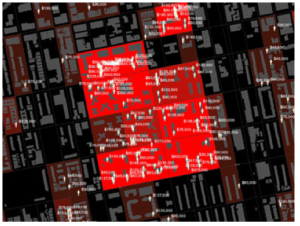 Kurgan’s Million Dollar block project (read about it here) creates maps that identifies the amount spent on incarcerating citizens in terms of where – the blocks – prisoners lived. These data representations make clear that the government spends over a million dollars on imprisoning the residents on some blocks in particular neighbourhoods. This raises the question of how the state invests in communities in particular ways, in terms of prisons and divesting rather than in investing in people. Natalie Jeremijenko’s NoPark is located in emergency spaces, where spaces are left for emergency vehicles can park in case of fires. The installation transposes the global emergency of climate change in the local by planting a reed bed that filters break fluid and uric acid that washes off the street to prevent it contaminating the water supply. The mini-parks also provide a space where people can meet and talk. The strengths of these sorts of installations is that they communicate complex, structural issues in concrete and tangible ways. There are loads of such examples but one criticism is that these are small-scale, elite and exclusive projects that seek to engage the engaged rather than create meaningful changes to the way the vast majority people experience the world (Markussen 2011). Jeremijenko’s NoPark arguably could be everywhere but in the main the charge stands. This is important because when we spoke to potential participants as part of the development of the application, some were interested and some were a bit put off by the idea of these, perhaps, gimmicky projects. One woman said, “That’s all well and good but if you ask people what they want in Manchester, they want jobs or skills to get jobs.” If funded, we hope to bring together the provocative and arresting content of political design with the participatory, inclusive and practicable of more mainstream approaches to design. This is no mean feat. How do you create something that is political and provocative yet useful, scalable and that can provide jobs? Tax is an incredibly important political and social issue. There are coffee shops that don’t pay (much) tax but for a variety of arbitrary and questionable reasons their tax affairs do not need to be made public in the premises in the same way as health and safety information. Through a membership-scheme businesses could advertise through augmented reality where they pay tax and how they contribute to the community. As easily as you can find via Google how far the nearest pizza parlour you could find the nearest coffee shop that pays tax. If you are standing outside, the tax and employment status of the business could be represented virtually to remind you. British lions could roar if the business banks in Switzerland. There are many issues with such a project. It uses exclusive and expensive technology to supposedly include the poor. Furthermore, what new information does this provide? People know that some businesses don’t pay tax and might only want a coffee in peace and quiet, even if they were forced to think about it we might prefer to ignore it while we sip and read. I acknowledge these concerns but think that such projects are still worthwhile. To refuse them outright ignores how our lives, thinking and society are drip-drip-drip defined by subtle makers and dynamics. Prices and costs are everywhere. What we think of as ‘public’ space is typically owned by some company or other and our right to remain is conditional, usually on buying something or at least fitting in. Our aesthetic experience is intricately and (new word) entanglingly consumerist. To ignore the potential of new technologies to represent and provoke new realities, at least before they are dominated by capitalist concerns, is I would argue to admit defeat.